I've been testing iOS 9 public beta for the last few days on my iPhone an iPad. Overall, the latest and greatest from Apple is doing great but some glitches are showing up from time to time. In the YouTube app, when an ad is displayed, the countdown is showing "ad.skip_in_seconds" instead of the actual time for skipping the ad. 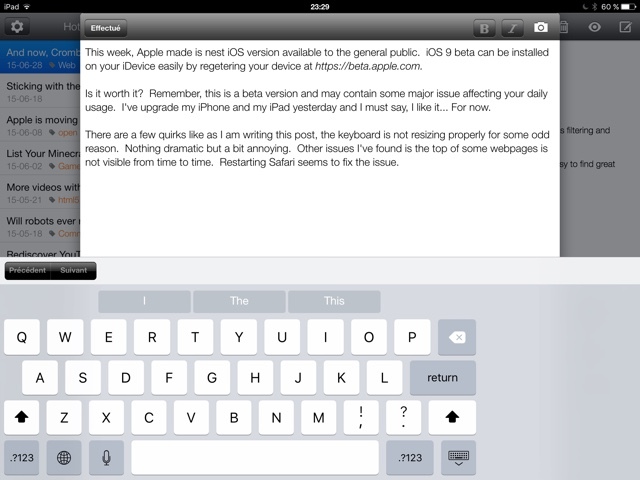 Switching keyboard language leads to a strange resided keyboard in the Blogger app. In the Mail app, the top of an email is not showing up occasionally. Most issues are happening on the iPad 4th generation. If you plan to upgrade to iOS 9 public beta on your iPad 4, you wait a bit for next release. It's not that bad, but annoying nevertheless. The iPhone 6 is working like charm for now. Should you install iOS 9 public beta? This week, Apple made is next iOS version available to the general public. 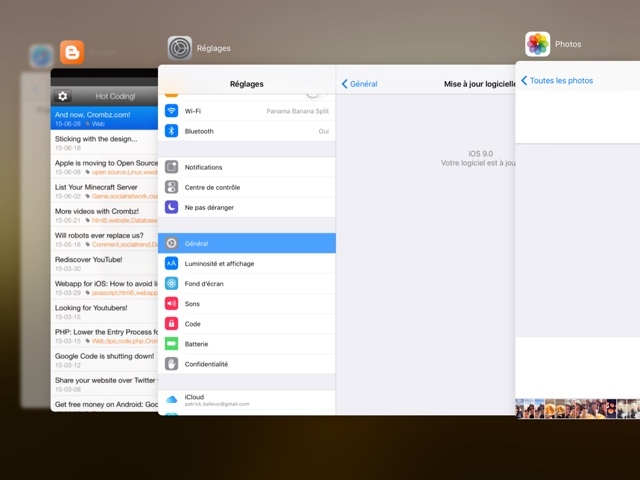 iOS 9 beta can be installed on your iDevice easily by regetering your device at https://beta.apple.com. Is it worth it? Remember, this is a beta version and may contain some major issue affecting your daily usage. I've upgrade my iPhone and my iPad yesterday and I must say, I like it... For now. There are a few quirks like as I am writing this post, the keyboard is not resizing properly for some odd reason. Nothing dramatic but a bit annoying. Other issues I've found is the top of some webpages is not visible from time to time. Restarting Safari seems to fix the issue. On my iPad 4, iOS 9 is a bit slower than iOS 8.4. Animations when switching apps is a bit sluggish and do not feel as snappy as it was. I've red ducked the animations to avoid the issue. Probably this will be fixed in a future version so I am not worried. On my iPhone 6, all is working as expected. I haven't found any issues for now. Beside having the latest and greatest features on my devices, there are a few notable features that I do really enjoy. Mainly, the new keyboard and the new Control Center. They keyboard has been updated with a few minor feature for copying and pasting or selecting text by using two fingers. The best new feature is a simple thing: uppercase and lowercase mode are now showing on the keyboard, making it a lot easier to figure if I will write in uppercase or lowercase. This was a minor annoyance but it was about time. I also find that the keyboard is a bit more responsive than before. It maybe an illusion or just me having visions but as I'm writing this post, I do feel like keys are more responsive than the keyboard in iOS 8.4.
iOS beta 9 is not for everybody. It's a risk to take. In my case, I am pleased for now. I keep my files and important stuff on my NAS so it's not an issue if I have to reset everything. If you are relying heavily on your iDevice in your daily usage, you should wait for the final version instead. It's fun to discover the new features but not at the cost of preventing your normal usage. If you have the urge of testing iOS 9 public beta, make sure to backup everything using iTunes on a computer before upgrading. The whole process will take about 45 minutes, depending on your bandwidth and device generation. I'll continue testing out iOS 9 and post as I make discoveries.